On Wednesday morning at the Camp Nou, Luis Enrique Martínez García signed his contract as the new first team manager of FC Barcelona. The Asturian signed a two-year contract shortly before heading for an official presentation to the media in the Auditori 1899. 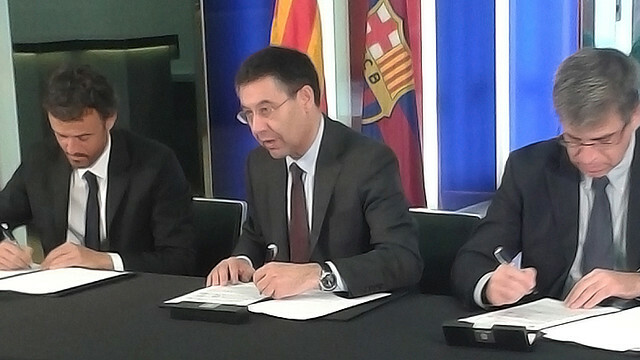 The venue for the signing was the Presidential Suite in the stadium, where the former player and B team coach was joined by the president of FC Barcelona, Josep Maria Bartomeu, the vice president for sport, Jordi Mestre, and director of sport, Andoni Zubizarreta.